Provide comfort for the family of Dolores (Martin) Arruda with a meaningful gesture of sympathy. 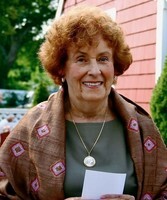 It is with great sadness that the family of Dolores Arruda announces her passing at the age of 87, on April 15, 2019 at Bedford Falls Assisted Living Community in Bedford, NH. Dolores was born on September 29, 1931 in Fall River, Massachusetts. She graduated with honors from Durfee High and went on to secretarial school. It was in Fall River that Dolores met her husband, John Arruda a soldier returning from service overseas. On September 2, 1957 the two were married and spent many happy years together until John’s passing in 1996. Dolores and John had several homes but settled in Acton, Massachusetts where she remained for many years. While in Acton, Dolores worked for Minuteman Vocational High School, a skilled bookkeeper, she also helped students choose courses, order books and assisted teachers with whatever challenges arose in their day. Though Acton always remained near and dear to her heart, Dolores began a new chapter in her life when she moved, in 2013, to Amherst, New Hampshire to be closer to her family. The greatest happiness for Dolores was gathering together her growing family. The mother of three, grandmother to five and great grandmother to two, loved nothing more than seeing all of her loved ones seated around a holiday table. Her skill at making her home warm, festive and beautiful at Christmastime was truly remarkable. She loved to garden, quilt, knit and bake. An avid traveler, Dolores saw the world touring Europe with John and later, with many trips abroad with family and friends. A long time member of the Acton Women’s club, she loved volunteering and joining the ladies for interesting outings to local museums, art galleries restaurants and shops. Dolores leaves behind her three children, Gary Arruda, Christopher Arruda and Melanie Guest, her grandchildren Valerie Arruda, Jessica Adamyk, Michele Deris, Daniele Guest and Adam Guest, her two great granddaughters Lydia and Marilyn Deris and her brother, Raul Martin. A funeral Mass will be celebrated Monday, April 22nd at 10:00 A.M. in St. Elizabeth of Hungary Church, 89 Arlington Street, Acton, with burial following in Woodlawn Cemetery, Concord Road, Acton Center. Following the burial at Woodlawn Cemetery, Dolores' family would like to invite everyone to join them for a light luncheon at 11:30am at the Red Raven Restaurant in Acton. We encourage you to share your most beloved memories of Dolores (Martin) here, so that the family and other loved ones can always see it. You can upload cherished photographs, or share your favorite stories, and can even comment on those shared by others. In memory of Dolores Arruda.